Tidewater Chinese School (TCS) is located in campus of Old Dominion University (ODU) in Norfolk. 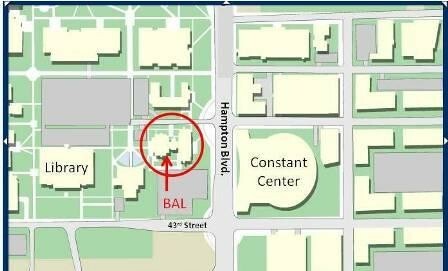 The address of ODU is: 5115 Hampton Boulevard, Norfolk, VA 23529. TCS classrooms are located in the Batten Arts & Letters building (BAL, Bld #112 in the map below), which is the tallest building on campus located at the corner of 45th Street and Hampton Blvd., directly across from the Ted Constant Convocation Center (aka “The Ted”).